Whether you're looking for a super-realistic training tool, a fun basement/backyard plinker or are just a fan of finely crafted Italian sidearms, the new Beretta M9A3 select fire C02 air pistol is the airgun for you. 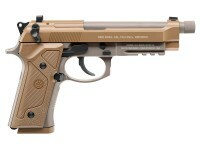 Officially licensed by Beretta, the Umarex M9A3 is a faithful reproduction of the 9mm firearm it simulates. From its blowback-action slide and faux suppressor-accepting, threaded barrel, to the three-point picatinny rail under the front of its frame and full-sized magazine, this FDE-colored lookalike is a dead ringer for the real powder burner. It even fits holsters designed for the M9A3 firearm. Further enhancing this C02 air pistol's realism are an authentic, ambidextrous safety, standard-function magazine release button and thin, Vertec-style, plastic grips. What's more, this model features a full-auto function for blasting through its 18-round BB magazine with one tug on the crisp, clean-pulling trigger. 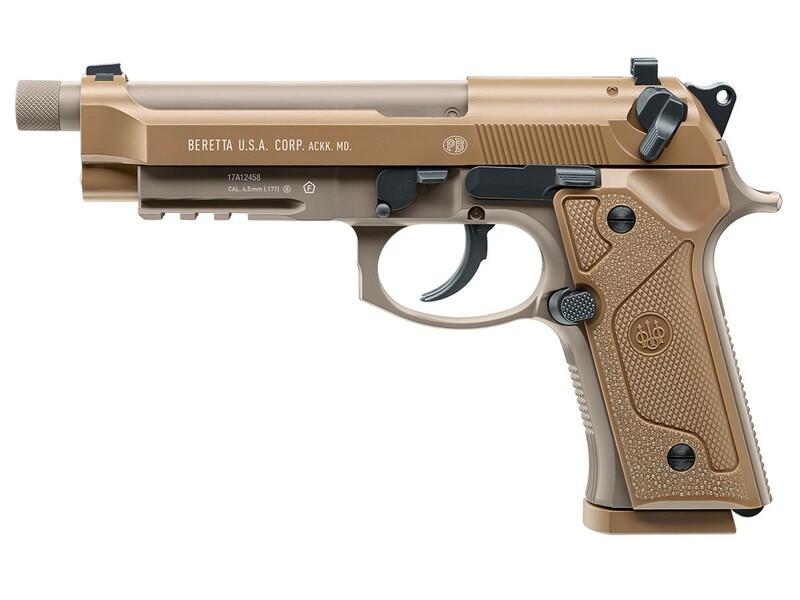 No matter if you're tactically training at home, knocking down soda cans for fun or punching holes in paper targets, this .177-caliber Beretta M9A3 C02 pistol from Umarex will ensure you'll have a blast doing it. Things I liked: Gun looks like the real M9A3 (I have one), seems to be well made and feels good in the hand. Good sight picture with the 3 white dots. Full auto firing is fun. Things I would have changed: Add adjustable sights. Make the safety be a safety/decocker like the real M9A3, including the angle. What others should know: Accuracy is terrible and the sights are non-adjustable. This is probably the least accurate out-of-the-box pistol I've ever bought. Using Umarex CO2 and BBs, the gun shoots 2 to 3 inches low from a distance of 15 feet and, of course, even lower from 30 feet - same with Crosman CO2 and BBs. Slide cannot be racked unless the safety is off. This replica does not have the safety/decocker feature of the real M9A3 - it has only fire or safe positions. Also, the safety does not have the slight upward angle of the real M9A3. Can shoot about 50 to 60 BBs per CO2 cartridge. Things I liked: There is much I like about this M9A3 beginning with it being another variant of the classic M92. 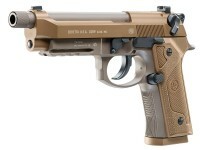 Except for the grips and other minor parts, this M9A3 is all metal. The bicolor finish is excellent and very attractive. The grip back strap is straight which make the pistol a little more comfortable in my hand. The safety is ambidextrous. The M9A3 has the same semi-auto / full auto selector as found on the M92A1. The M9A3 and M92A1 magazines are interchangeable. The blowback is strong, and the slide locks back when the magazine is empty. 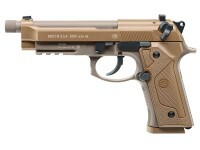 The M9A3 can be field stripped. Despite the low point of impact using the open sights, the M9A3 shots group well. Shooting Black Diamond BBs from a bench rest at 18 feet to target produced a 1.25" 10 shot group. Total shot counts using either Umarex or Crosman CO2 are about 60 whether shooting slow semi-auto or rapid full auto. Things I would have changed: Front and rear sights are fixed and non-adjustable. The rear sight is a separate piece mounted in a dovetail with the mounting screw apparently inside the slide. Although the front sight appears to be mounted in the slide using a hex screw, there is no indication that it is adjustable for windage. The owner's manual does not say anything about either sight being adjustable. The consequence of the fixed sight is that shooting from 18 feet using a 6 o'clock aim on the center spot yields shot groups centered about 2.5 to 3 inches below center and about 1 inch left of center. What others should know: To compensate for the low and left point of impact, I attached a LaserMax Spartan Green laser to the M9A3 front rail. Once the laser was sighted in, I was able to use a center aim and hit the point of aim. Shooting from a bench rest at 18 feet to target in single action produced the following shot groups. Umarex Steel: 10 shots: 1.75"; 8 shots: 1.13". Black Diamond: 10 shots: 1.25"; 9 shots: 0.97". Copperhead: 10 shots: 3.06"; 8 shots: 1.44". Daisy Premium: 10 shots: 1.50"; 7 shots: 1.06". Avanti: 10 shots: 1.50"; 8 shots: 1.00". Excite Smart Shot copper plated lead BBs were not a good choice for my M9A3 pistol which produced a 10 shot group of 4.81". Shooting off hand standing using a center aim with the LaserMax laser yielded slightly larger groups that were still well centered on point of aim. Things I liked: The dark earth gives you the feel for the real thing good quality. What others should know: Buy extra mags have fun .